Call me Pisces. I'm mother of two daughters and we live in Frankfurt am Main, Germany. My younger daughter will turn 8 soon and is in 3rd grade of primary school, the older one is almost 11 and in 6th grade of Gymnasium. They both started school early so they are the youngest pupils in their classes. In Germany, there are 16 federal states of different sizes – some states actually are just one city, such as Bremen - and each has its own general education system which makes things hard to explain. Every child attends primary school (grade 1 – 4, approx. from age 6 – 10, in some states grade 1 – 6, age 6 – 12). Afterwards, they go to secondary school. The traditional school system after primary school is the tripartite system: Hauptschule -secondary modern school-, Realschule -middle school- and Gymnasium -an academic secondary high school- but there are Gesamtschulen (comprehensive schools), too. I took the translations from an Internet dictionary, not sure if they’re really correct. In some states, teachers recommend a certain kind of secondary school for a child but in the end the parents decide whether they’re going to send their son / daughter there or choose another kind. In some states, the teachers’ commendation is mandatory. In some areas, first and second graders are educated together, in others not. Both of my daughters’ schools have canteens. Meals are sponsored by the municipal administration to keep the prices low and make school dinners attractive. We pay € 3,00 (£ 2,39) per meal, some students are eligible to reduce-fare and pay € 1,00 (£ 0,80) per meal. The meals usually consist of one main course (vegetarian choice available), salad, dessert and fruit. Since pupils are not allowed to use electronic devices on school premises my girls can’t take pictures of their school dinners. Not to mention that they don’t eat there too often since they don’t like the food (unless there’s something like pizza on the menu). “Your good cooking spoiled us, Mum”, they say. I would feel flattered but if I didn't think they just try to make me pack their favorite lunches. 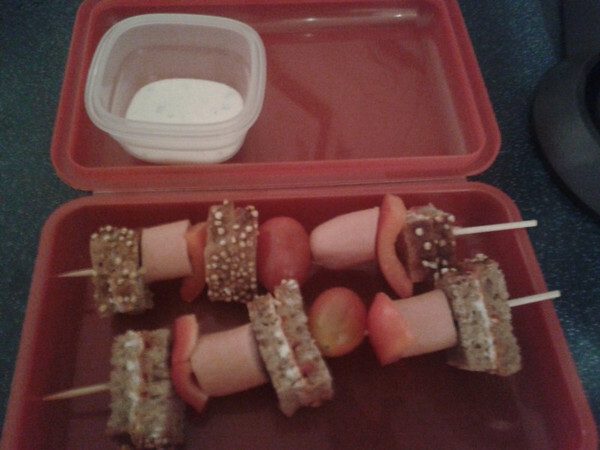 Last week was a week of packed lunches because the school menus had many meals my daughters loath. Semolina pudding, for example, or vegetarian bratwurst. I took a guess at the costs of each lunch. The pomegranate for example was 0,99 € but was divided in several servings and so was the box of cherry tomatoes and the bag of clementines. 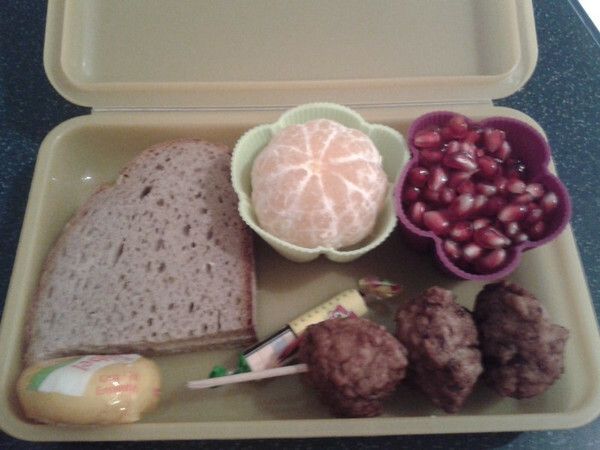 Rye-wheat bread with butter, a clementine, pomegranate seeds, homemade turkey meatballs (leftovers from dinner the day before), a mini-babybel and some candy as a treat. Both children said they liked it a lot but would have liked it even better if there had been some ketchup for the meatballs. Bites: Both girls forgot to count all week because they were busy chatting with their friends. 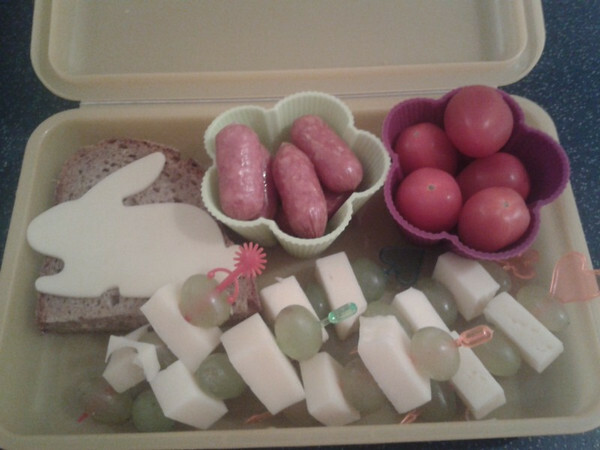 Rye-wheat bread with butter and gouda bunny, mini-cabanossi, cherry tomatoes and grape-and-cheese-sticks. I gave them extra sticks because they like to share them with their friends. My younger daughter doesn’t like the cabanossi so she had pretzel snacks instead. 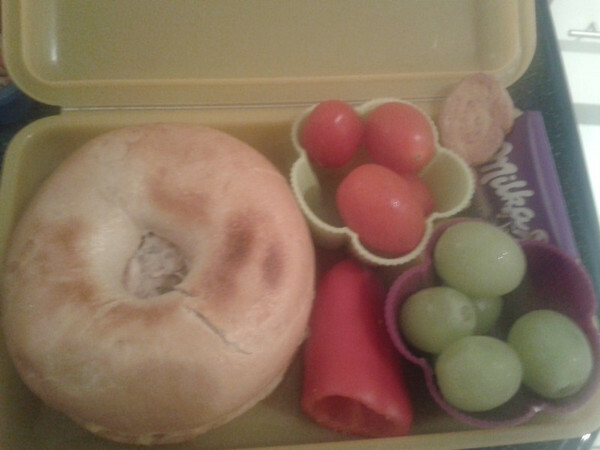 Here we’ve got leftovers from supper the day before: a bagel with tuna salad (canned tuna mixed with a little bit of Miracle Whip, sour cream, chopped cornichons and grated cheese), cherry tomatoes, grapes, a piece of sweet red pepper. There’s also a homemade cookie and a small piece of chocolate for a treat. My younger daughter didn’t finish the bagel, it was too much for her but she ate about half of it. This one’s a picture of my snack box. I was in a hurry that morning so I forgot to take pictures of my children’s boxes. It’s whole-wheat bread with cream cheese and tomato puree, bits of wieners, red pepper and cherry tomatoes. In the small box there’s a dip made of quark (curd? ), yoghurt, lemon juice, fresh herbs and spices. My daughters also had half an apple and some raisins. 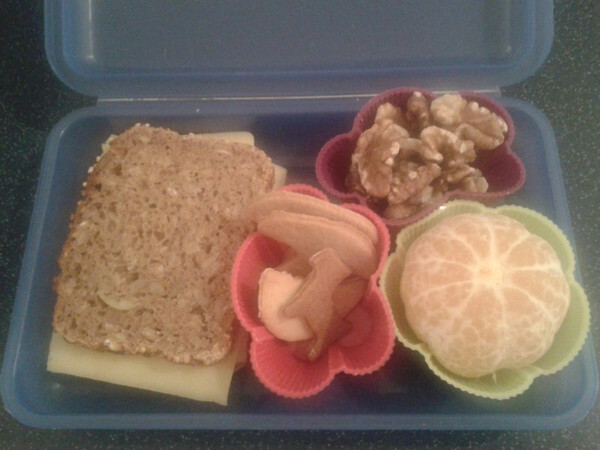 This is today’s lunch: whole-wheat bread with butter, lettuce, tomatoes and cheese, some walnuts, a clementine and a couple of homemade cookies. Food-o-meter: 6/10 (They don’t like whole-wheat bread unless it comes in bitesized pieces.). These lunches look amazing! You put in so much effort into making such lovely looking box lunches. And you gave me some ideas for my son's boxes! Veg Hello, I am Brazilian and I am using a translator on the internet for comment. I'm not very good with English. I love your blog, I am a nutritionist in my country. Congrats. I would even be able to quote your blog on my blog so that more people know that you are a special girl preoccupied with healthy eating. Your lunches look great! You put in a lot of effort, so much better than when I was in school. A packed lunch in England in the 1970s was often a sweaty pork pie, white bread, an apple and a bag of crisps. Parents didn't know any better then. Those are beautiful lunches. Plus, I really like those silicone flexible containers for the small things. really cute and inviting. So delicious looking - wish my mom had made lunches like that for me as a kid. Those lunches look tasty and are - in my opinion - even quite healthy. Maybe if we were talking "Little House on the Prairie" here, but then, since we're talking about the days before electricity, there wouldn't be any internet, either. And I have a feeling that even Mrs. Ingalls had more important things to do than make "mayonaise yourself with less oil, by using joghurt instead. And with some canned tomatoes, spices and vinegar you can do some nice - and healthy - ketchup-ersatz." Like probably washing, peeling and canning the tomatoes Charles had just brought in from the garden in the summer. Chopping wood in the winter. In fact, I doubt Laura and her siblings ever got tuna salad (or any other kind of tuna) at all. Or bagels. Or clementines or pomegranates. Modern mums, even those not required to work outside the home as well in order to keep their families financially afloat, really don't need anybody making them feel even more guilty than they already do all by themselves. Especially some faceless stranger on a blog that has already made quite a name for being critical of everything and anything. my comment and the advise to look on the internet for some recipes to make mayonaise and ketchup yourself was given, because Pisces herself lowered her health rating for her meals due to the fact that she used industrial made mayonaise and ketchup. So it was in no way my wish to be too critical about her meals. I even rated them as "tasty and quite healthy". But I could have done more.. I could have given some more detail about self-made mayonaise with yoghurt to reduce oil and self-made, less sugary ketchup.. So here are now some recipes for these. And, as You might notice, both take an amount of time that even a working mum could be able to spend in the kitchen to prepare some ingredients ahead for the next day's school lunch. 2. Now Blend all the ingredients with the hand blender. 3. Add Yoghurt. Blend again. 4. Check consistency. The mayonnaise should now be nice and creamy. Put in fridge to use the next day. Time needed: less than 5 minutes..
Heat the oil in a pot. Put the diced onion and ball pepper in it and let it simmer a while, 'til they are soft. Add tomato paste and canned tomatoes. Let it simmer on low temperature 'til it's reduced / condensed to about half of the starting amount. Take the pot of the stove. Use a hand blender to blend to a creamy consistancy. Use a spoon to press all through a sieve. If put in a jam jar, you can keep this ketchup in the fridge for a couple of days. Who are you to tell anybody else how much time "even a working mum could be able to spend in the kitchen"? I saw nothing that indicated "Pisces herself lowered her health rating for her meals due to the fact that she used industrial made mayonaise and ketchup." And the downgrade on the health scale that mentioned "mayo" was because the lunch was made with Miracle Whip (which contains a lot of sugar), not actual mayonnaise, home-made or otherwise. By the way, I make my own mayo and ketchup on occasion and I know it takes me about 5 minutes just to drizzle the oil in to keep it from breaking. That doesn't include the time to get out all of the ingredients, put them all away when you're done, put the resulting mayo in a sealable container, wash the utensils used to make it, etc., etc. And I don't own a hand blender. Not everybody does, you know. As to making your own ketchup, it takes a darned sight more than 30 minutes. Or maybe you buy your red peppers and onions already peeled and finely diced? And as long as we're at it, why make it from canned tomatoes? Shouldn't you really go out and pick your own out of the garden? All of which is moot anyway as it's not up to you how much spare time anybody else has got. Might you ever see your way clear to simply compliment a lunch without having to find fault with at least something? Yep, my children eat those lunches ;-). Sometimes, they're a little strange: they like asparagus, black olives and pasta with gorgonzola & leaf spinach but they hate seminola or rice pudding and yeast dumplings with vanilla sauce. Today, however, she refuses to eat any potatoe products other than chips / french fries - no mashed potatoes, no gratins, no crisps. The younger one is quite normal and just refuses to eat most vegetables when they're cooked. And we do have discussions on a nearly daily basis about the amount of whole-grain products in our meals. I take a lot of effort to teach them about healthy food which isn't always easy: they were involved in dinner preparations quite early. Can you imagine the mess when a 5 and 2 year old help Mummy in the kitchen? But I think it was and is worth it. Also, they both attended cooking classes at primary school sponsored by Sarah Wiener Stiftung. And I can imagine the mess left by two kids of that age in a kitchen when they "help" preparing a meal. But You're absolutely right in thinking it's the best way to educate them about healthy eating. Would be great if more parents would be ready and able to follow Your example. Nothing like a good old homecooked meal! Those lunches look fantastic! I love the containers too, everything is reusable.